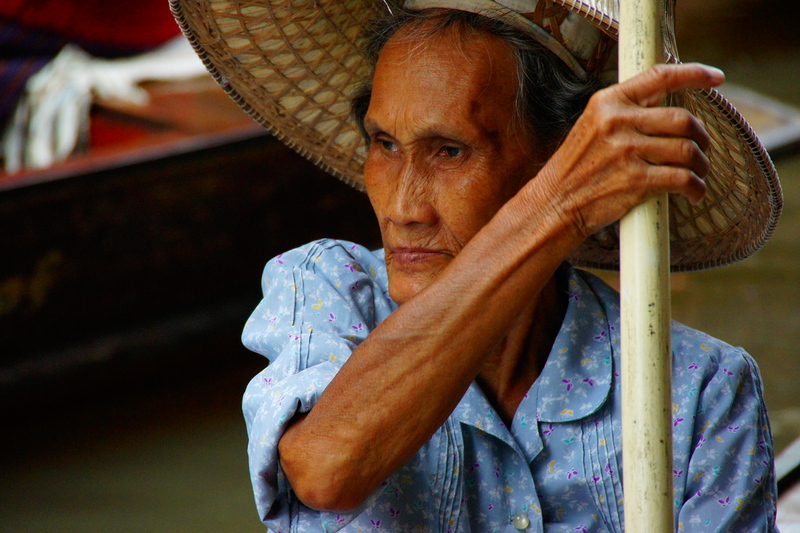 An elderly Thai lady wearing a conical hat dips her paddle into the water as I fire off an exposure of a vendor arranging an assortment of fruit at her individual stall. As a passenger on this small vessel making its way down a canal, I’m surrounded by colorful displays of goods and inundated by exotic smells at this Thai floating market. Visiting markets (especially floating ones) is one of my favorite travel activities; however, the scene I tried to convey above is far from the truth. What I failed to mention is that the boat I’m on is packed with other foreigners (Thai: farang) with a plethora of other vessels – both behind and in front of us – transporting even more tourists. As a travel photographer, this is a treasure trove of an opportunity to take candid portraits while capturing all of the colorful exotic displays and bustle of this Thai floating market; however, as I’ve pointed out in a previous article, impressive travel photos don’t always have an equally impressive story behind them. Conflicted by the reality of the situation, I can allow myself to feel entirely jaded by the experience or just go with the flow; I decide on the latter and continue pressing down on my shutter release as I wander around the floating market. 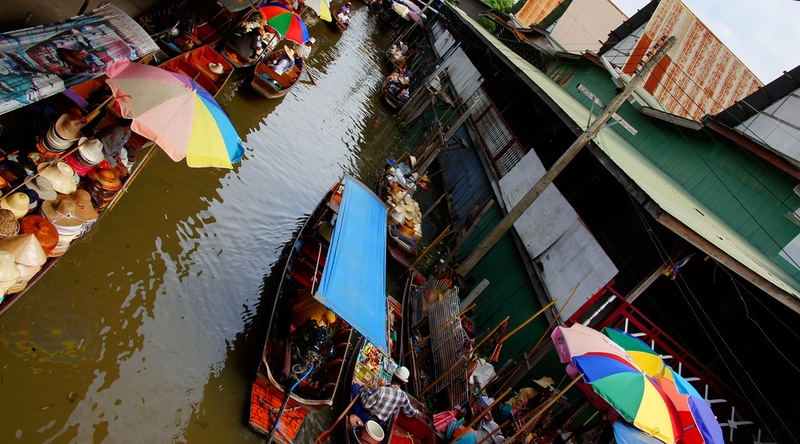 As a now popular tourist attraction, Damnoensaduak floating market was originally the name of a canal dug by military personnel during the reign of Thai King Rama IV. Rivers and canals, at the time were the lifeblood of transportation and goods; however, the now crowded market caters mostly towards tourists. 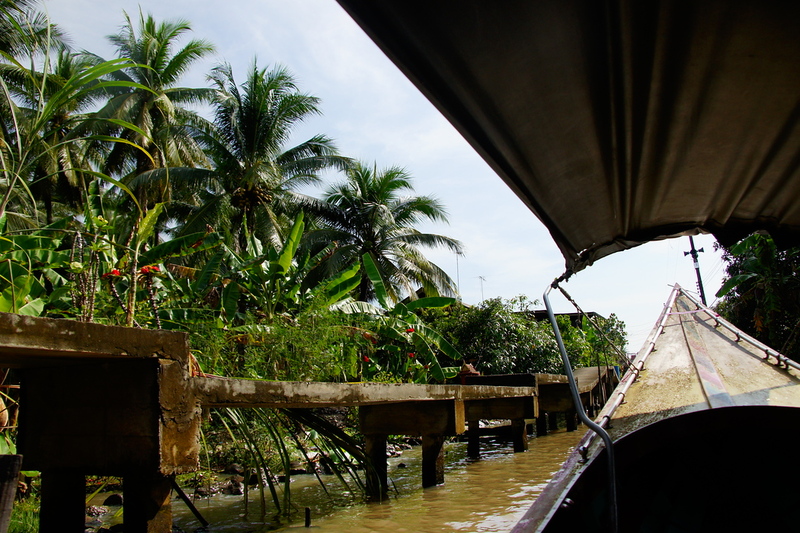 Scenic views from our longboat of lush green vegetation and murky brown waters prior to reaching the Thai floating market. An elderly Thai lady paddles here way down the canal in a tiny vessel while trying to avoid colliding with much larger ones. 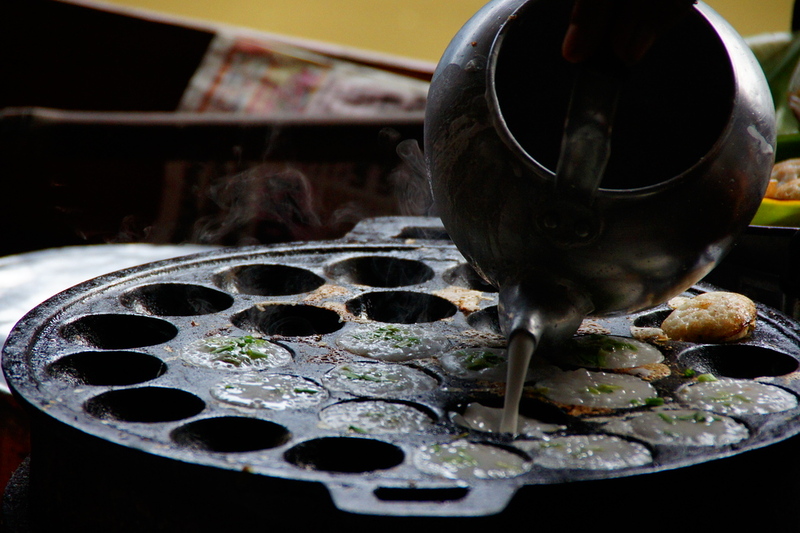 Batter is being poured into a mold being used to make Thai cakes. 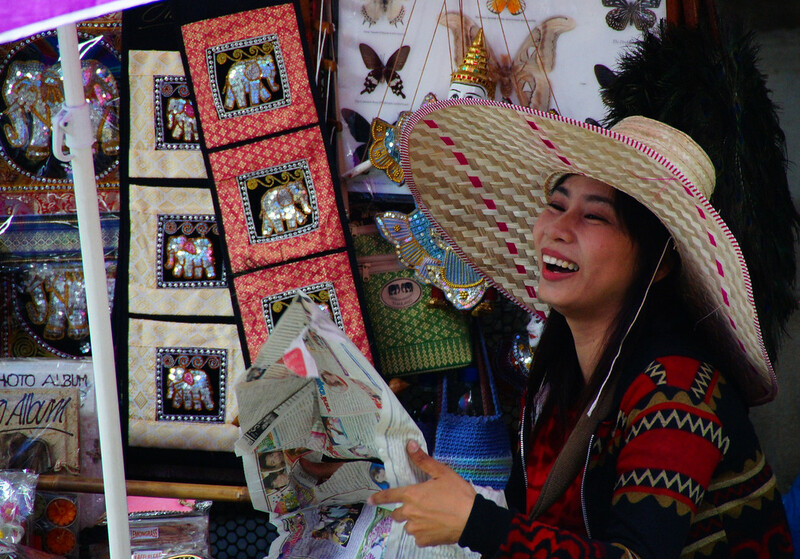 A Thai lady vendor with a collection of hats for sale flashes a smile. 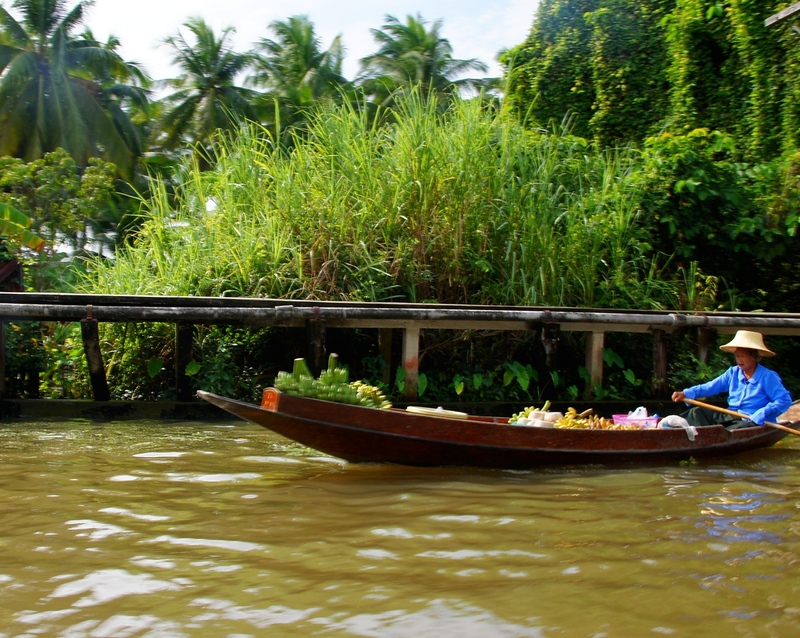 This is a side perspective shot of a Thai lady rowing a boat loaded with fruit to the floating market. 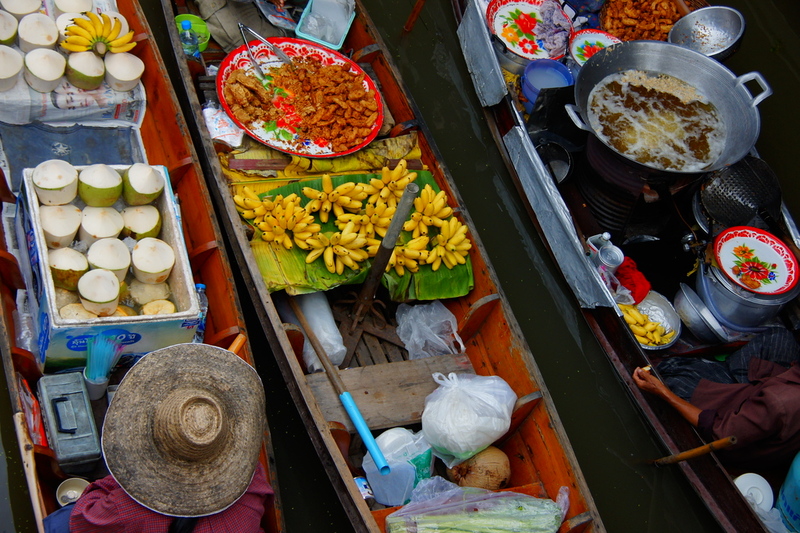 An overhead perspective shot of the colorful Thai floating market. 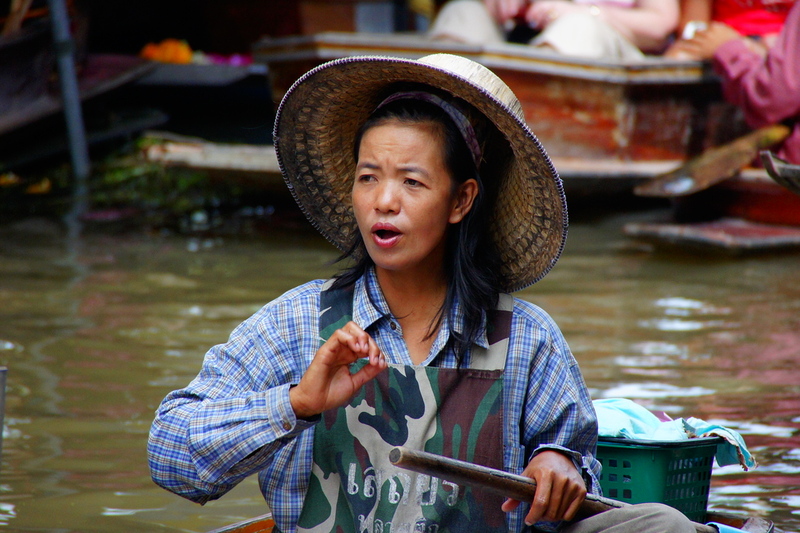 A candid moment, where this Thai lady is communicating with another vendor at the floating market. A Thai lady with dyed hair makes eye contact with a group of tourists. An overhead perspective travel photo of three rowboats filled with fruit (bananas and coconuts) passing each other at the same time. A friendly exchange between two Thai vendors both selling deep fried banana wedges. 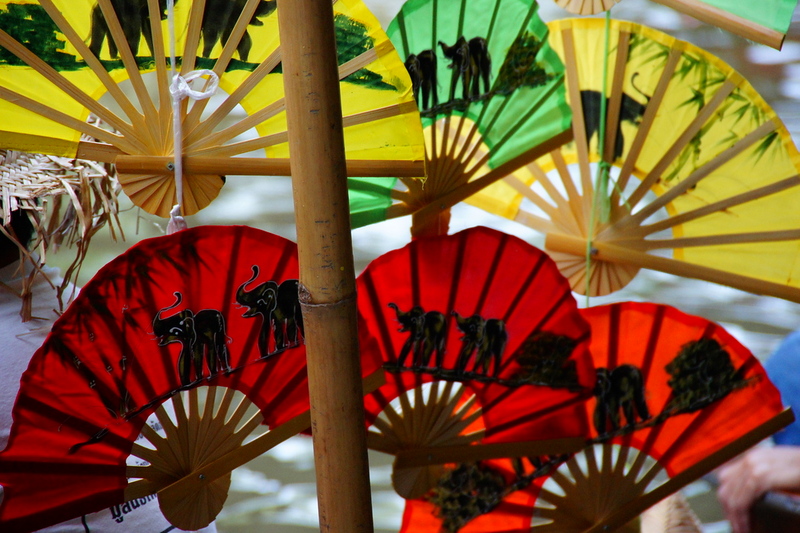 Colorful fans for sale with elephant patterned designs. 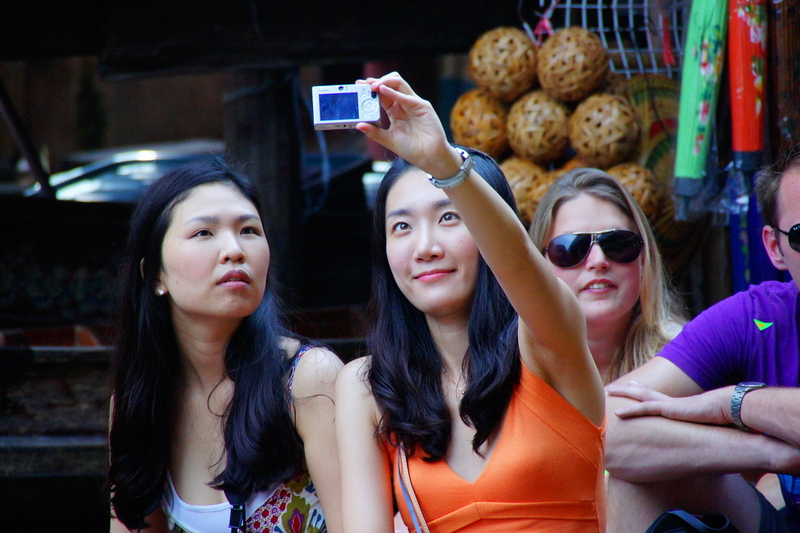 A selfie portrait from two tourists visiting the floating market. 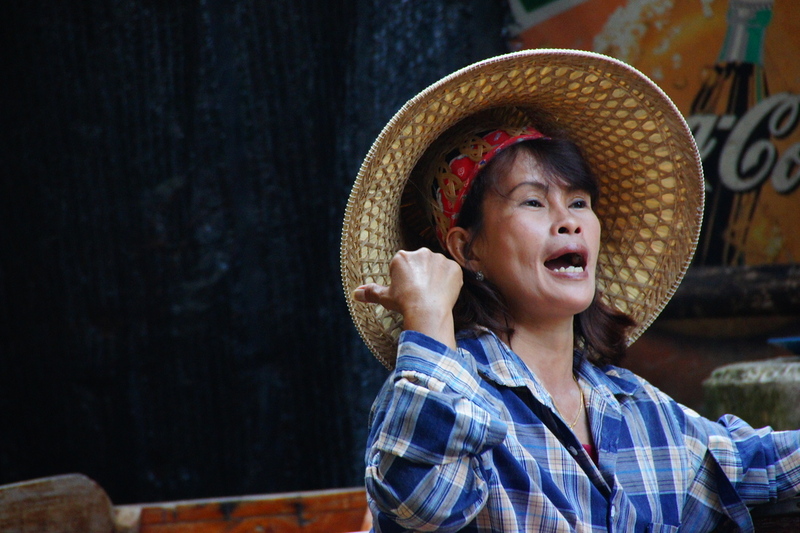 A candid photo of a Thai lady wearing a conical hat and army fatigue inspired apron. How do you feel about visiting an attraction that clearly caters towards tourists? Nice Market.We were seeing Live Big Lizards on the banks of canal as we were moving to the center market place. I love the floating village. For some reason, I thought these were only in Vietnam. I will be taking a SE asia trip in August of next year so I’ll be sure to pass by here! Indeed, you’ll notice these floating villages are quite common in SE Asia. The biggest one I’ve visited was Kampong Ayer in Brunei. Love to visit this place. The photos are captivating, especially the ones with real people. I love to explore the historical places and local foods in Thailand. People look friendly too. Thanks for taking us there Samuel. You’ll have a lot of fun doing that in Thailand. I already miss the food and I left just two weeks ago! I know what you mean… the more travelled our world becomes, the harder it is to get experiences without other tourists ruining the moment… but you did an excellent job of snapping some candids and capturing the market! Love this photo essay! Markets are among my favourite places to people watch, but I have yet to visit a floating one; looks like it would be a treasure trove for travel photography. It’s great that you were able to capture people so candidly! I’m guessing you were using a pretty long telephoto lens here? Hey great post Sam. 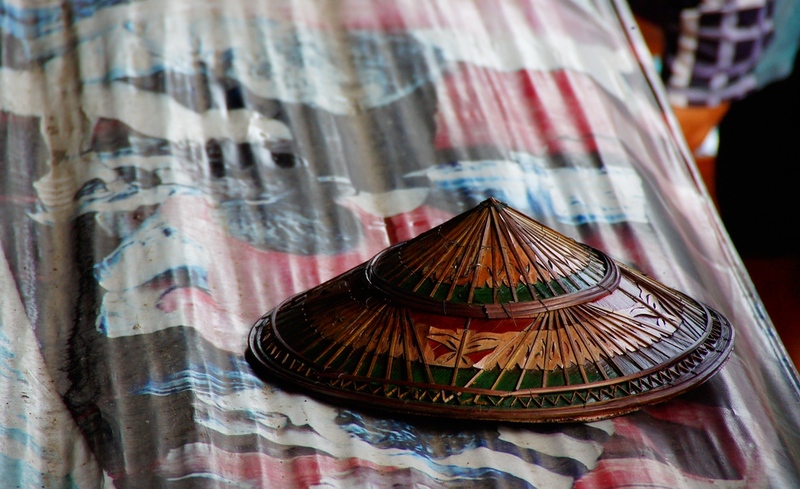 Love the one of the rice hat. We’re starting to find ourselves in “touristy” situations and sometimes, just because tourists are there, doesn’t mean it’s catered to them. We’ve started going to cultural shows and musical concerts that are full of tourists, but it’s the only way to really see the traditional music and dance in some places. Also, lots of the time if you’re in a “touristy place” half of the tourists are locals. I think it’s worse to avoid “touristy” things and miss the experiences all together in some cases. I agree with you Nick. I like to have a balance of both when I travel. If you avoided everything that was ‘touristy’ you’d sure be missing out on a lot of things! Fantastic images! 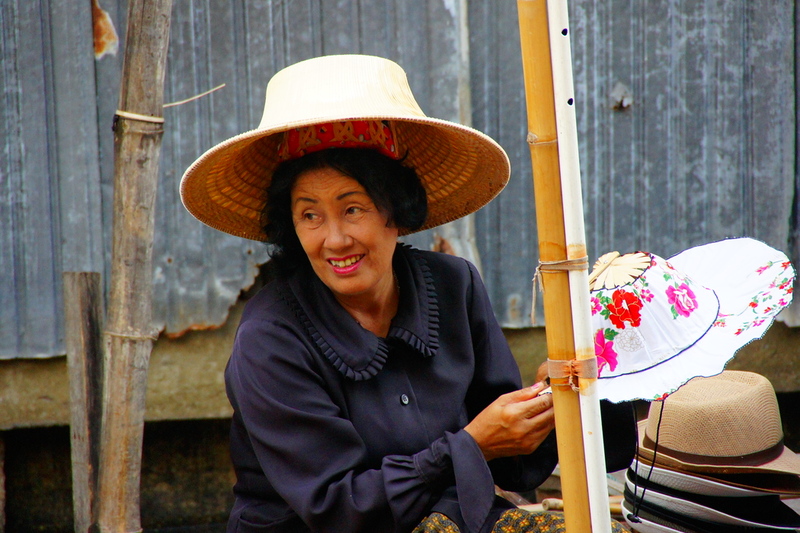 I love the emotions you have captured in the candid photos as well as the colors of the floating markets. Sometimes you get your best images in areas catering to tourist! That’s true! I think it’s because they’re used to having their photo taken and aren’t phased by it the slightest. They are very unique! I’m thinking of taking my parents next year. I will be in Thailand for a couple of weeks in November and December. These photos are psyching me up. That’s awesome Ted! Best time of the year to be visiting Thailand 🙂 Where do you plan on going? I am going south to Singapore, Malaysia, Borneo. Pretty excited! That’s awesome! Try to hit up Malacca if you can. Beautiful photos mate. I headed here later this year. I cannot wait to explore this market, it has been on my list for years. There is a lot to do in and around Bangkok. As a photographer you’ll really enjoy the different opportunities. Gorgeous, I love the large format images, it just makes the scenes pop, great job Samuel….btw do you accept guest posts, I would love to do one of my photo essays for your audience? I try to do photo essays at 1000 px. I’m not currently accepting guest posts but I may open that up again next year. I know it’s very touristic but I just loved the floating markets in Thailand, they are so unique, colorful and provide great photo opportunities. Wonderful photos, made me feel like I’m there again. I may head back again early next year to show my parents. I frickin’ love those Thai cakes! About visiting an attraction catered to tourists. It’s not something that’s my first choice and I try to avoid it rather than search for it. But some attractions are just too good to skip. I agree with you regarding tourist attractions. I don’t want to cover everything that’s in a guidebook; however, certain things are worth visiting. Great photos as usual Sam! The photos, food, and even hats look great but man that water is just well not very appealing. I like visiting the roads less traveled. The wifey on the other hand likes the popular places. After all they are popular for a reason as she would put it. Thanks Thomas! Yeah, unfortunately the waters (whether at this canal or taking a water taxi in Bangkok) tend to be filthy. I think a mix of both types of travel is ideal. Inevitably I often end up at tourist attractions in my travels. There is a reason why they are tourist attractions in the first place. So to me they are worth a visit. I just don’t like it when they get too crowded or expensive. So if I go or not will highly depend on my mood. I feel the same way you do about visiting these kinds of places. It’s often dictated by my mood and prices. Sometimes I’ll just randomly wander around somewhere instead of visiting a popular attraction. I often find that just as (if not more) rewarding. Stunning photopraphs very real and showing great emotion! Thanks Andi! 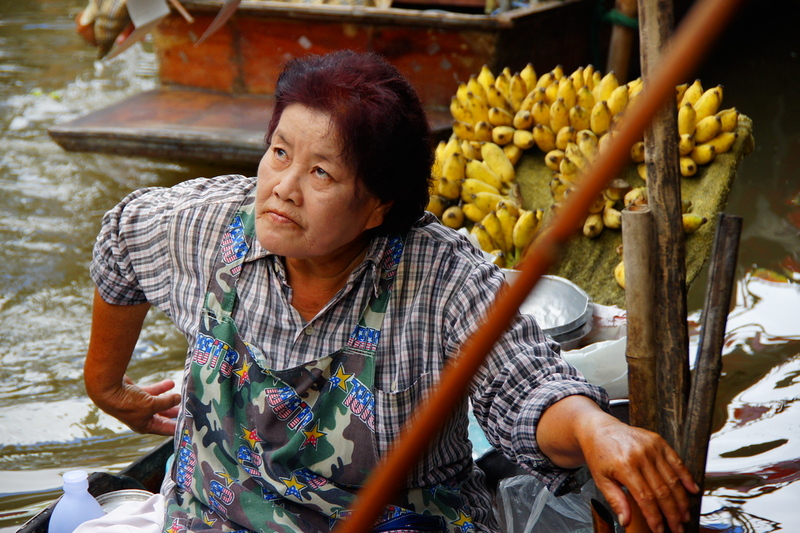 Floating markets are a great place to take shots of people. Splendid and vivid photo essay! I especially like the portraits in this series! I agree with what you’re saying. I don’t think I’d ever come back here again; however, it is was ‘okay’ once. In the Canary Islands, our markets are as much for locals as they are for tourists. The exception that proves the rule? Erm, that would be the floating market at Tenerife’s Siam Park. Most of the time I’ve been fine eating street food. I’ve actually been sick more often from eating in restaurants abroad. The markets are admittedly very touristy though none the less always prove so visually decadent. You did a brilliant job of capturing fabulous candid shots! I am amazed by how much can be accomplished in the space of a very small boats – entire thai kitchens and small floating business! Thanks Mary! It is amazing how much they can pack into the space of just a tiny vessel! 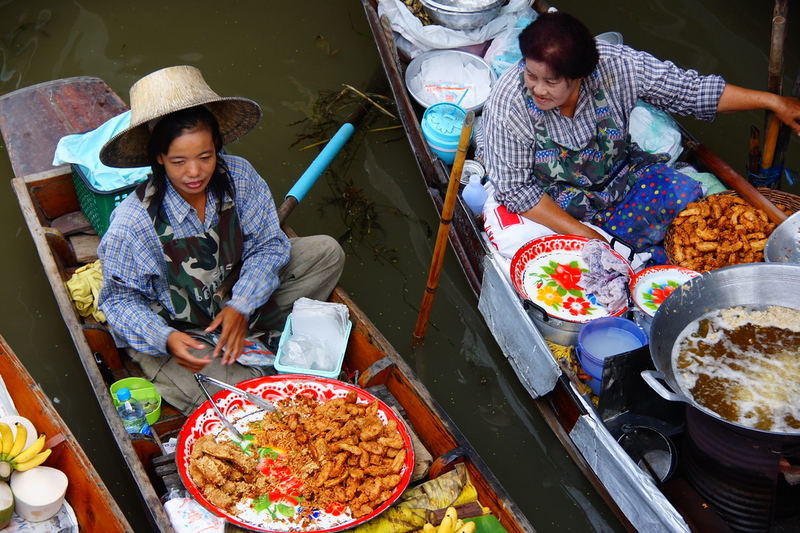 I wrote a bit about them here; the end of floating markets? http://live-less-ordinary.com/southeast-asia-travel/taling-chan-floating-market-bangkok. Amphawa is probably the better choice for floating markets but again horribly touristy. I prefer going to the lesser known ones. Not great for photo-ops but more local and authentic in feel. Thanks! I checked out your post and totally agree with your assessment.